I got a copy of her first cookbook, Prep-Ahead Meals from Scratch, and I highly, highly recommend it! We have loved every recipe we have made so far. This year, Alea has a new cookbook out, as a follow-up to the previous one. This time, she is focusing on prep-ahead breakfasts, lunches and desserts! 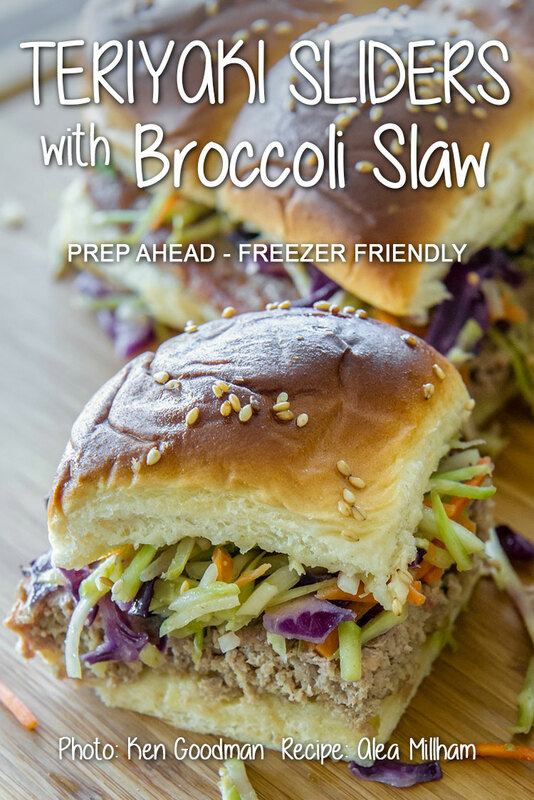 Photo courtesy of Alea Millham and Page Street Publishing Co.
Alea has graciously allowed me to share with you one of the recipes from her new cookbook, and so today I bring you – Prep-Ahead Teriyaki Sliders with Broccoli Slaw! This is a perfect lunch (or light dinner) for summer! It is easy to put together and doesn’t take long to make. Best of all, you can use this as a freezer meal! Either freeze the entire group of sandwiches for a later meal, for a potluck, picnic or barbecue, or bake and then freeze individually for easy work lunches or meal prep. We made these for lunch yesterday and they were gone in a matter of minutes. Everyone loved them, including the littles! I love that it got them to eat some additional veggies without much fuss. This is definitely a permanent addition to our meal rotation. I used 80/20 ground beef when making them. I used a quarter-sheet pan, which is roughly 9×12, and it was perfect! The ground beef will shrink in the oven, but I found that in the end, it was actually the perfect size to fit on the sweet rolls (big enough to cover them all, but not leave a lot of extra on the edges). If you don’t have a quarter-sheet pan (I love mine and have three, highly recommend them), opt for a cake pan, which should be about the right size, of if you just have casserole dishes, go with a 9×13. I saved some time with the slaw by finding a commercially-prepared broccoli slaw mix that included the grated broccoli, carrots and purple cabbage all in one at my local Walmart, and used that instead of preparing them individually on my own (mostly because I couldn’t find grated broccoli by itself and I was too lazy to make my own). The dressing comes together in about a minute – pour it over the prepared slaw mix, and you’re done with the slaw! The sliders came out warm and crispy on the outside, and juicy on the inside, with just the right amount of crunch with the slaw! You can make the slaw and burger patties without the sesame oil, but I really think you’d be missing the best part of the flavor package, so don’t leave that out unless you absolutely have to. It was all I could do to hide two of the sliders from the hungry hoard at my house so I could freeze them for lunches for my mom. This is such a gourmet take on some fun little sliders, and I highly, highly recommend then for your next picnic, potluck or barbecue! 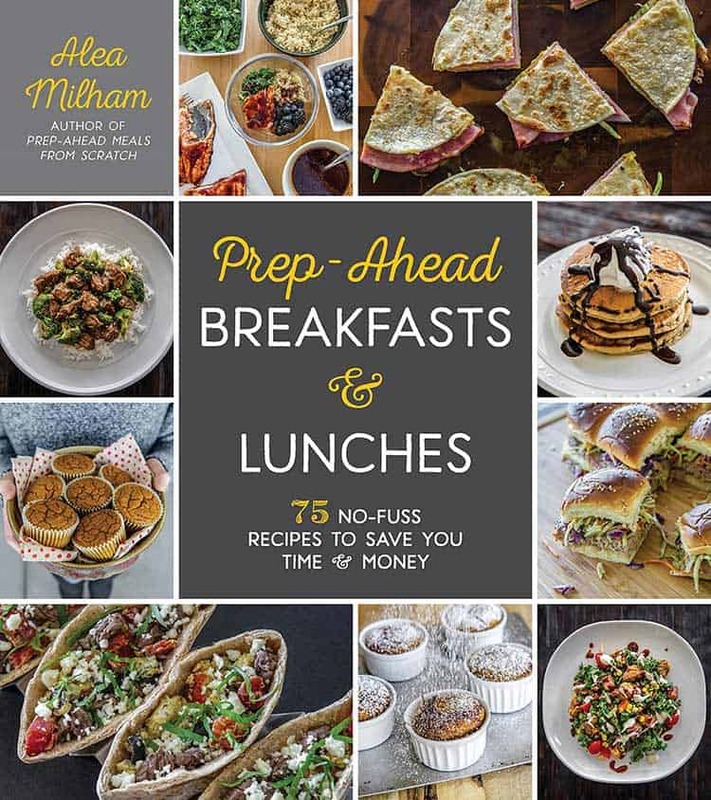 I also HIGHLY recommend that you get a copy of Alea’s book, Prep-Ahead Breakfasts & Lunches! You will NOT be disappointed – I promise! It is a fabulous companion to her Prep-Ahead Meals from Scratch, and with both, you’ve got every meal covered, including dessert! Disclaimer: I have not been paid for this review or for my opinions on this recipe. I did receive an advance copy of her cookbook for review, but I already knew it would be terrific because I am familiar with her previous book and had tried many of the recipes in it. I genuinely love this cookbook and Alea’s recipes. I have made them for my family and have used several of them in taking meals to family members. I have included links to buy the cookbooks on Amazon, and I do receive a small percentage of each sale as an Amazon Associate. But even if I didn’t, I still highly recommend both of these cookbooks! The recipes are easy, versatile, adaptable and make-ahead-able (and many are freeze-able, too)! Eating healthy and from-scratch does not have to take hours of your time each week. Alea’s cookbooks are proof of that! Can’t get enough sliders? Be sure to check out my Hawaiian Sweet Roll Sliders for another variation! 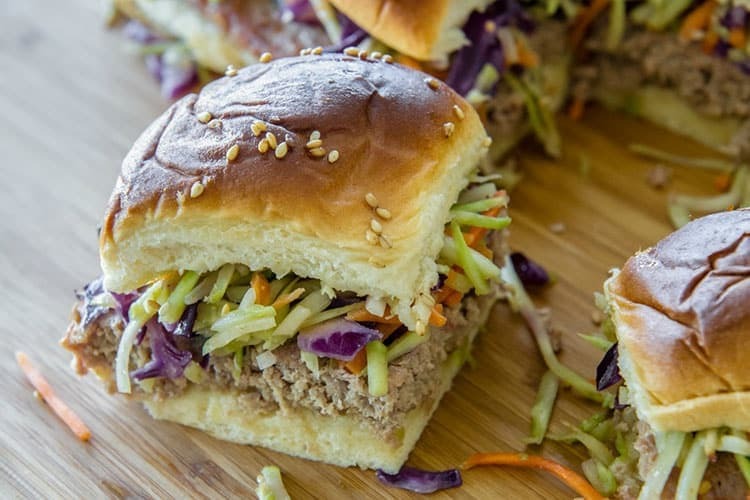 These sliders are an Asian-inspired alternative to the traditional game day sliders. 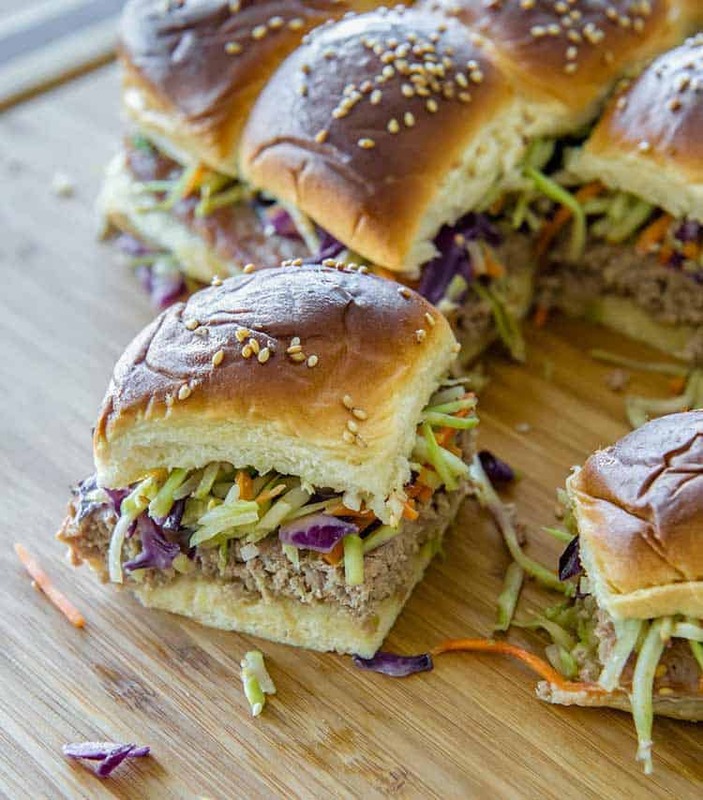 Both the meat and the slaw in these sliders have a rich flavor, so you don't need to add any additional condiments to the burgers. Great for lunch or dinner, these can easily be made ahead for picnics, potlucks, parties or barbecues! Preheat oven to 350F. Grease a 9x12-in baking pan, then line it with parchment paper. In a medium bowl, combine the ground beef with the teriyaki sauce, honey, sesame oil (if desired), onion powder, garlic powder and ground giner. Mix well until the spices are fully incorporated. 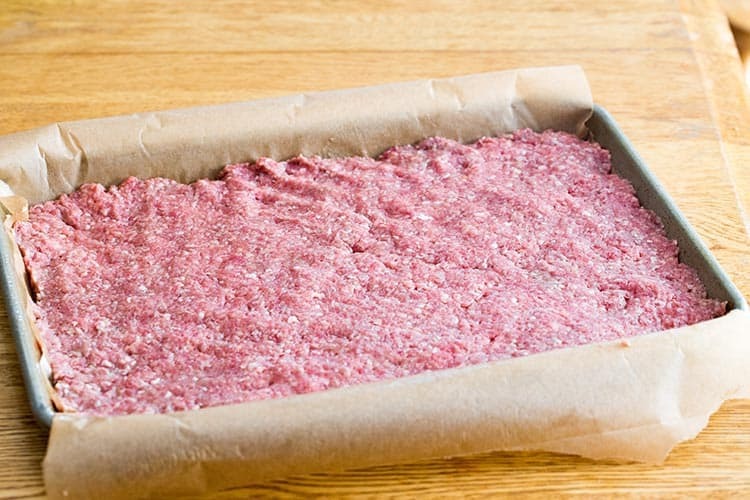 Press the ground beef mixture into the baking pan. Bake the beef for 20 minutes, or until the meat is cooked through. While the meat is cooking, make the broccoli slaw by combining the broccoli, cabbage and carrots in a medium bowl. Add the oil, vinegar, soy sauce, honey, sesame oil, ginger and garlic powder to a cruet or lidded jar. Shake well to blend. Pour dressing over the broccoli slaw and toss to coat well. When the meat is done cooking, remove it from the oven and brush any oil from the top with a pastry brush or blot it with a paper towel. Do not turn off the oven. To make the sliders, cut the rolls in half (separating top and bottom) and place the bottom halves of the rolls in a 9x12-in casserole dish. Place the meat on top of the rolls. Spread the broccoli slaw over the meat. Place the top halves of the rolls over the broccoli slaw. Baste the tops of the rolls with the oil and sprinkle the sesame seeds over them. Cover the casserole dish with foil and bake for 15 minutes, or until the sandwiches are heated through. Cut the sliders along the lines of the rolls and serve. Allow the sliders to cool before storing. Place them in an airtight container and store in the refrigerator for up to 3 days. To freeze, wrap each slider individually and freeze for up to 1 month. To reheat a thawed slider, unwrap it, place it on a microwave-safe plate and microwave on high for 20 to 30 seconds. To reheat a frozen slider, unwrap it, place it on a microwave-safe plate and microwave it at 50 percent power for 2 to 2 1/2 minutes. You may be able to find a commercially-prepared broccoli slaw mix that contains broccoli, carrots and cabbage already prepared. If so, you can substitute 3 cups of this mix for the individual components called for in the recipe.